A draft beer is one of the joys of a hot summer day--it's much better to many people than a can or bottle. However, it is just not practical to keep a keg of beer on hand in your house. The mini keg is a much smaller version of the traditional keg, but with all of the same qualities. There are 14 12-ounce cups, 10.6 16-ounce cups and 8.5 20-ounce cups in a mini keg. A mini keg is generally considered to be a miniature keg for containing beer that holds 5 liters or 1.32 gallons of beer. The mini keg is usually disposable and is made of aluminum with either a pressurized tap or a pour spout. The mini keg is about 1/10 the size of a full sized keg. Other terms for smaller kegs are pony kegs, beer balls or party balls. These types of kegs all hold 5 gallons or 18.9 liters of beer. A mini keg is much smaller than these types. 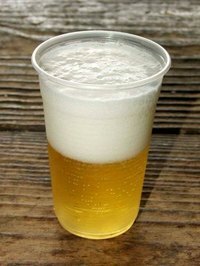 A typical can of beer holds 12 ounces, but most cups for parties will hold either 16 or 20 ounces of beer. When figuring out how many beers are in a mini keg, you must know how much your cups will hold. One liter is equal to 0.26 gallons or 33.8 ounces. A five liter mini keg is equal to 1.32 gallons or 169 ounces. Therefore, there are 14 cups of 12 ounces, 10.6 cups of 16 ounces and 8.5 cups of 20 ounces in a mini keg. The mini keg was called a "Bubba" in Canada by Molson. You can ask at a store for a "Bubba" and they will know you mean a mini keg. However, in America, there is a company called "Bubba Kegs" so the term can be confusing to American consumers. How Many Beers Come in a Keg?